Netflix has quietly launched a new community blog to interact with customers. Hello. Welcome to the Netflix Community Blog, brought to you by the team that is building the social elements of the Netflix site. I'm Michael, the director of this motley crew of rabid movie fans who also happen to be engineers, designers, and so on. We hope this will be a great forum for us to talk about what we are doing, and for you to tell us what you think. Netflix upgraded the Friends feature with several key improvements. Eric writes, "You can now edit/delete old reviews! 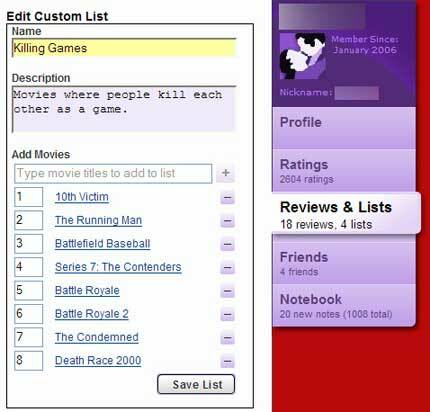 You can add/delete movies more easily to your custom lists. Images must not contain any obscene or objectionable content, including copyrighted images or images of other people. Failure to abide by these standards may result in your membership cancellation and other legal responses. If the community flags your image or any of your text, nickname or content as objectionable, you will first be given the opportunity to replace or edit said content. If the community flags your contents subsequently, it will be automatically removed and Netflix Customer Service will follow up with appropriate action. It looks like the default icon for your account is related to one of the genres you like most. It thinks I'm a romance fan because of the recent movies my wife picked out, while my friend is an action/adventure fan." Changes to the lists tab. Note the different images for each account. The Profiles tab lets you change your Nickname, image, and set your privacy level. To access the new features, click on the "Friends" tab, and then click on the purple tab on the right side. Thanks to Larry, Alan, & Eric (screen captures) for sending this in. Netflix just updated the total number of DVD titles to 80,000, while Blockbuster has 70,000 titles. Thanks to "H" for sending this in. 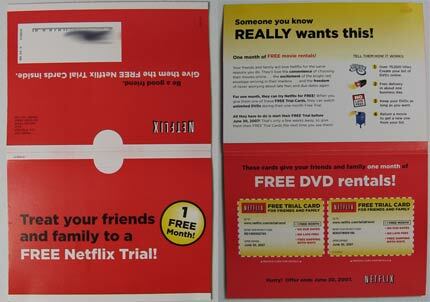 Netflix sent out a mailer with trial membership cards to subscribers. The mailer includes two cards you can give out to friends and family and includes a special code for a free, one month trial membership. Reuters is reporting that shares of Netflix dropped on a downgrade to "market perform" by Piper Jaffray analyst Michael Olson. Olson noted that as Blockbuster's in-store revenue shrinks, "one of (the company's) few remaining options to remain competitive long term is to spend on subscriber acquisition in (the) near term." "While we believe Netflix will be the ultimate winner in this market, the near-term disruption caused by Blockbuster will likely weigh on (Netflix) shares," Olson wrote. Sun Co-Founder Says Netflix & Blockbuster are "History"
UberPulse has a video of an interview with Sun co-founder Andy Bechtolsheim where he says that Sun's new video server will make Netflix & Blockbuster "History." "Netflix are working hard to be in the online video business... They proved that a better delivery model would just adopted... They could beat Blockbuster by saving you a trip to the store... and saving you the trip to the mailbox that would be even more convenient and you don't have to wait. The one thing about Netflix is that you say you want to see this but you don't know if it comes tomorrow or the day after or in the week... it's certainly not spontaneous! ", joked Andy "B". Meeting Tomorrow uses the Netflix "by mail" business model to ship audio visual meeting equipment to your hotel or conference. via Seth Godin, who noted that, "I'm betting that there are hundreds of applications of this idea, especially in the business-to-business area. Stuff that you need, reliably, but not often..
What buiness would you like to see use the Netflix model? Netflix Watch Now made the PC World list of the 100 Best Products of 2007. 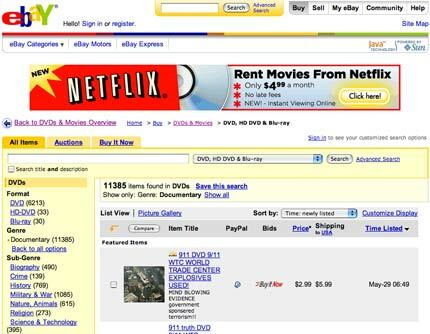 The Auction Bytes Blog has an interesting story about the controversy over the Netflix ads on eBay. Back in 2000, sellers were so angry when eBay did the same thing, they organized the "Million Auction March." That time, eBay backed down, and the "toaster ad flap," as it was called, is described in Adam Cohen's book, "The Perfect Store." When Yahoo Auctions decided to serve ads that competed with its sellers listings, it made the site free, but eBay sellers pay lots of money for listing fees on eBay. Netflix New Release Availability Problems? Netflixer in Baltimore writes, "Children of Men, released on DVD on March 27, 2007, just shipped to me today. It's been #1 on my queue the whole time, listed as very long wait. Have you heard similar stories of mainstream new releases taking so long to arrive?" Are you waiting on any new releases? What's the longest you've waited for a new release recently?